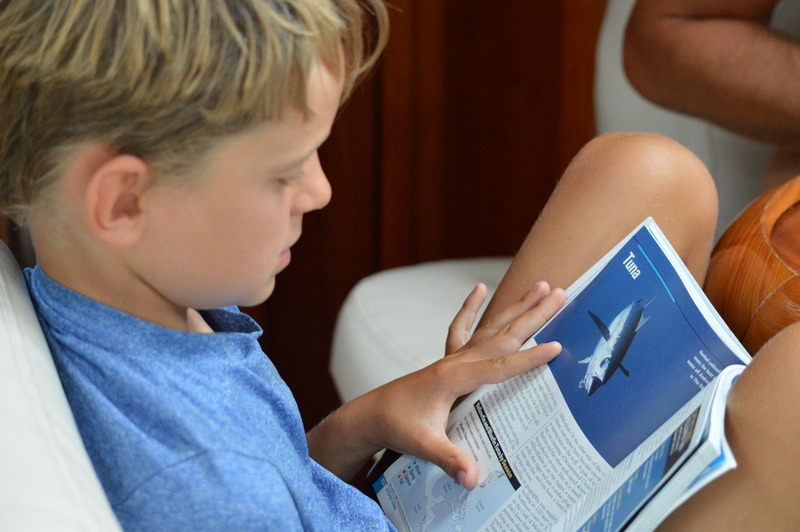 As part of homeschooling today, I decided to interview the kids and get their feedback on living on a boat for the last 5 months. Additionally, Jen and I answered the questions. 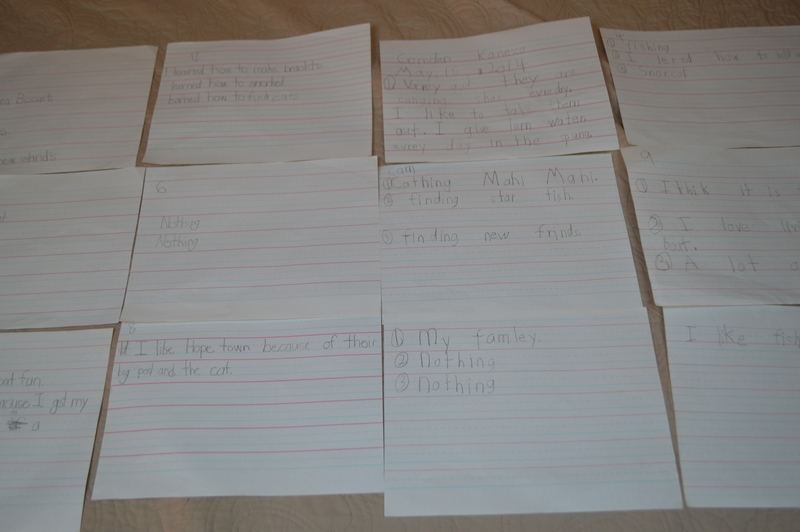 Below is a picture of their handwritten responses to work on their handwriting, and then I typed them into this blog. Camden is taking after his grandpa (Papa) and myself when it comes to messy handwriting. We are working on that. * Please note I typed the kids’ responses just as they wrote them, misspellings and all. 1-How are the hermit crabs doing? Joellen – They are still alive. Pinchy has changed shells. I give them water about every two days. I take them out of their tank and let them on my bed. Cam – They are god and they are canging shels evreday. I like to take them out. I give lem water every day in the spung. Marc – I was wrong when I thought they were a bad idea. They have turned out to be the perfect pets. The kids have shown a lot of responsibility in how well they are being cared for as well as a genuine interest in them. Jen and I really thought the hermit crabs would die after two weeks. Jen – I am SHOCKED (shocked I tell ya, shocked!) they are still alive. 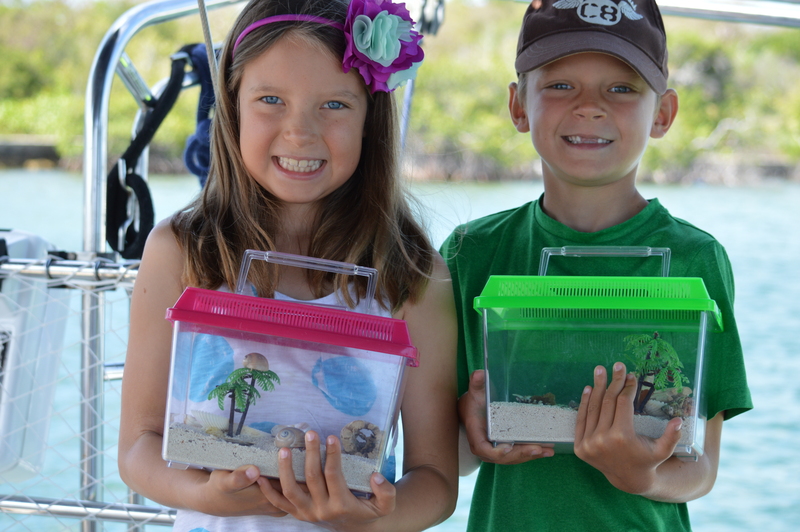 And I think it is really neat that Joellen and Camden each added two new ones to their tanks from the beach at Elliot Key, Florida. 2-What are the three best memories of your trip so far? 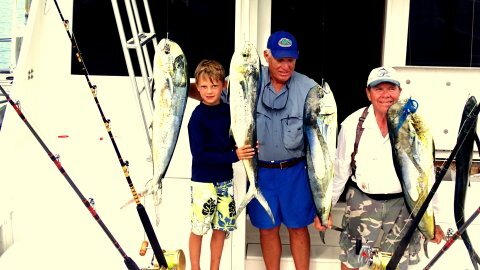 Marc – 1) Seeing Cam’s face as we brought in the Mahi Mahi 2) Family time around the table eating meals and sharing stories 3) Being at the helm sailing the boat 4) Watching the world unfold for the kids and seeing how much they have matured, become more creative, and how well they have learned to interact with adults. 3-What three things do you miss most from living on land? 4-What three things have you learned? Cam – 1) Fishing 2) I learned how to hold my pensil. 3) Snorcol. 5-What two things have scared you? 6-Tell me things that have surprised you about our trip? Joellen – How the beaches and the towns look very similar. 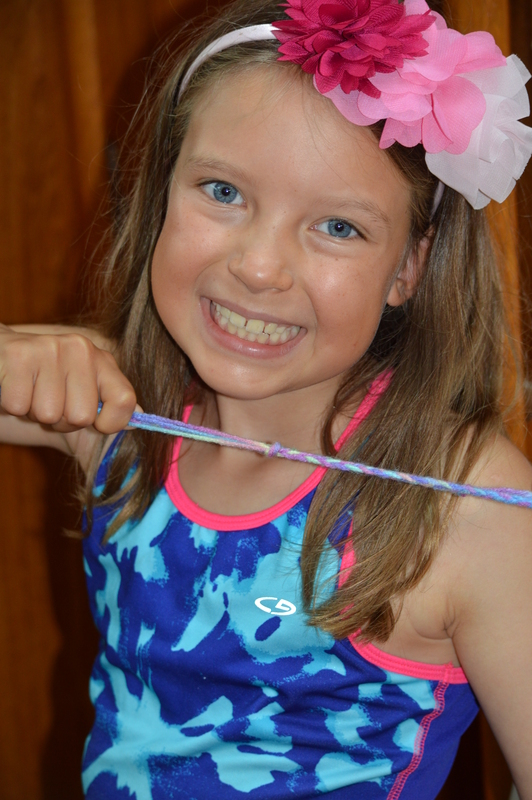 Cam – How much I really like fishing. Marc – 1) The amazing people that we have met. Truly, some of the most “real” people I have ever met in my life. 2) How much the family has taken to this adventure and in particular Jen. Initially, I felt this was more my dream than the family’s and after 5 months, I think it’s our dream. 3) What we are spending on a monthly basis. Going into it, we budgeted that we would spend about half as much on a monthly basis as we did on land but the reality is that we are spending about a quarter of what we spent on land. Jen – 1) How much I love the trip. 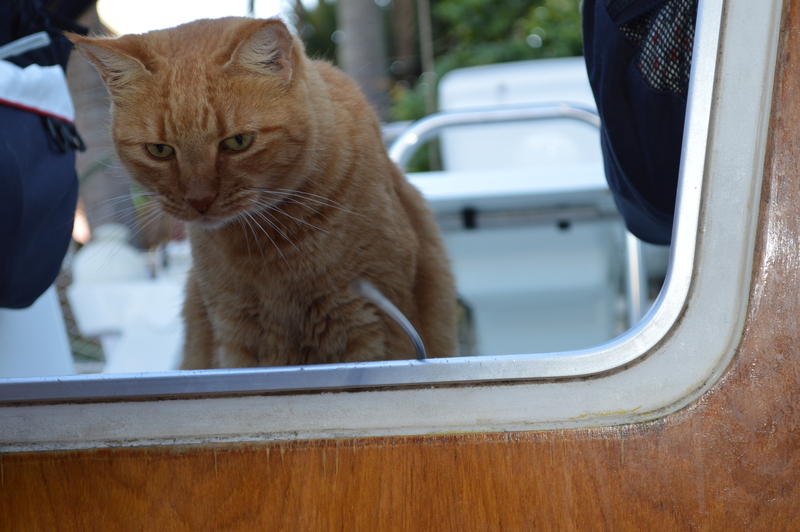 I thought that there would be many things I would not like about living on a boat. But it turns out that I love it more than I ever thought I would. 2) How quickly you become friends with other cruisers and locals (and sometimes even land tourists) and that you will have them as friends for life. 3) How I wear the same two outfits day after day 4) How I am somewhat scared to go back to life in the US. 7-My favorite anchorage is? Why? 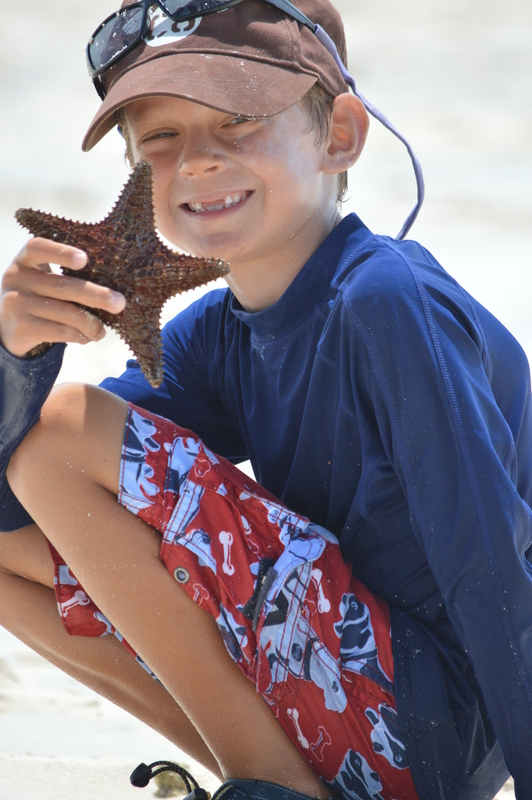 Joellen – I like Hopetown (Abacos) because of the big pool and Snow the cat. Cam – Bimine (aka – Bimini) because it had a lot of fishing. Marc – Hope Town, Abacos because of the people we have met, the beauty and quaintness of the anchorage, the variety of things to do (beach, golf cart, pool, lighthouse, surf, eat out, kayak) and availability of resources (people, food, restaurant, shops, internet, gas, diesel). Also, it reminds me of Camden, Maine (my favorite all time harbor). 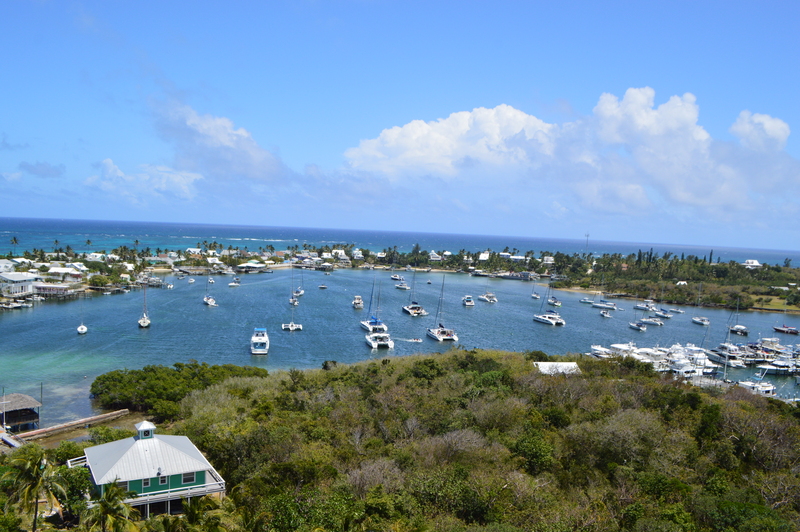 Jen – Cambridge Cay, Exumas because it was so remote but full of nature. 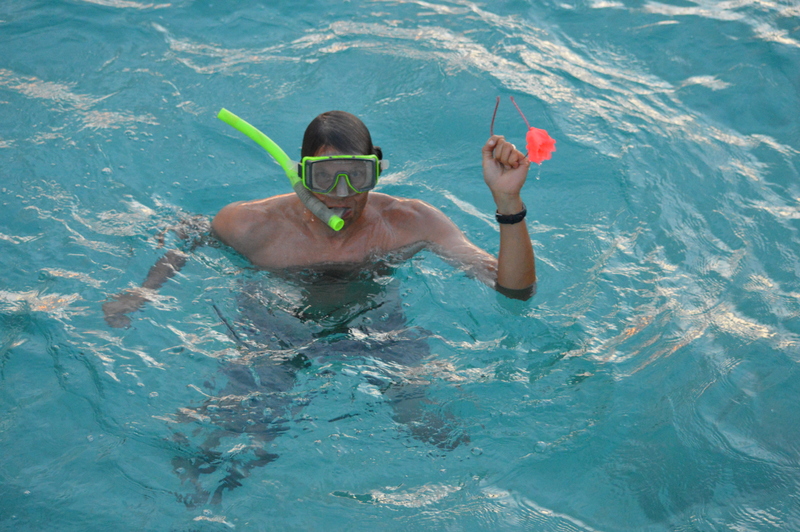 It had the best snorkeling, best exploring, and we got to spy on Johnny Depp’s private island near there. 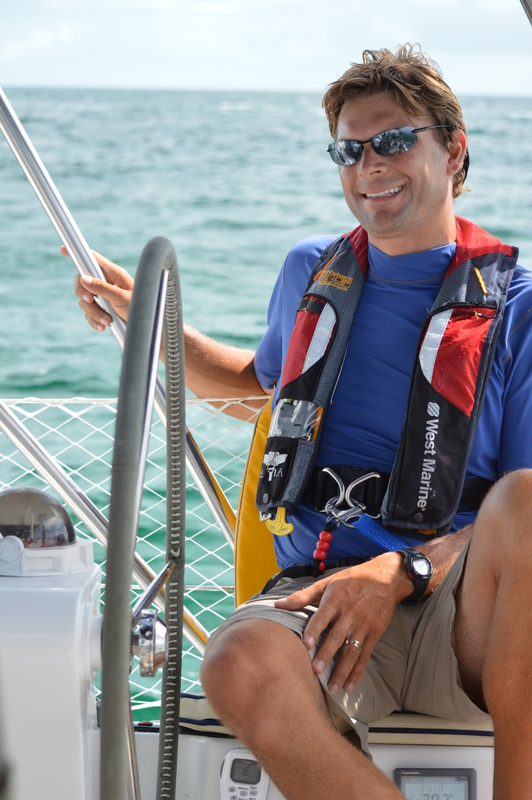 8-How would you describe living on a boat? 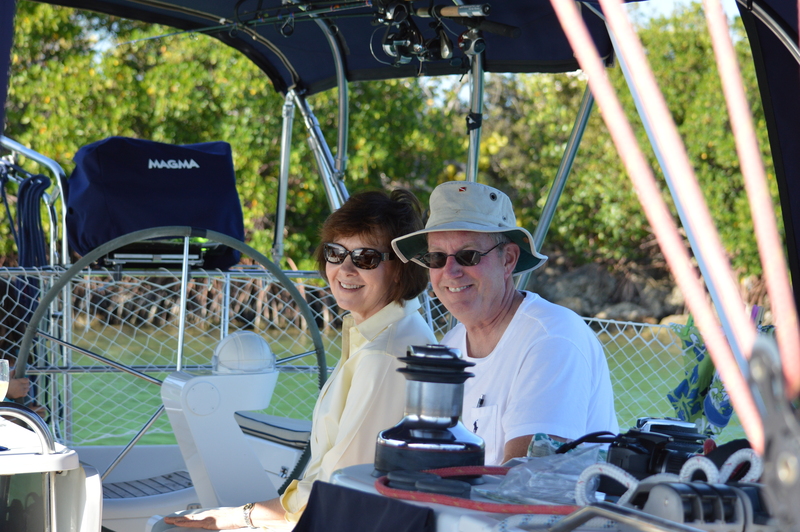 Joellen – I think living on a boat is fun. 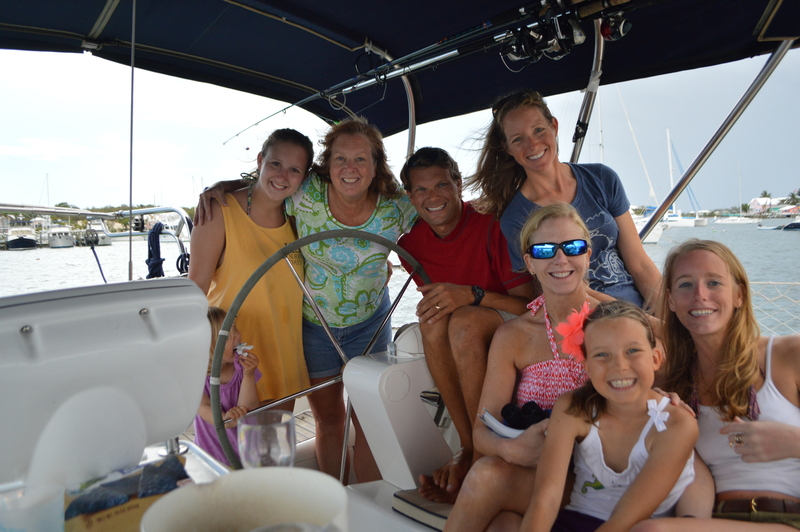 I also like my boat because I get my own room and we get to spend a lot of time together as a family. Cam – I thik it is fun. I love living on a boat. A lot of fishing. Marc – A great adventure for the family that has brought us closer together while at the same time challenging us greatly. It has created life long memories with the daily living, consisting of the highs being higher and the lows being lower. Jen – It’s a lot of freedom despite living in close quarters. But there’s also a lot of frustration living in close quarters. It is meeting new people every day that will impact us forever. It is waking up in the morning not knowing what the day will consist of and going to bed reflecting on all the new experiences that happened that day. It is not having a set schedule. It is living with less but feeling more fulfilled. 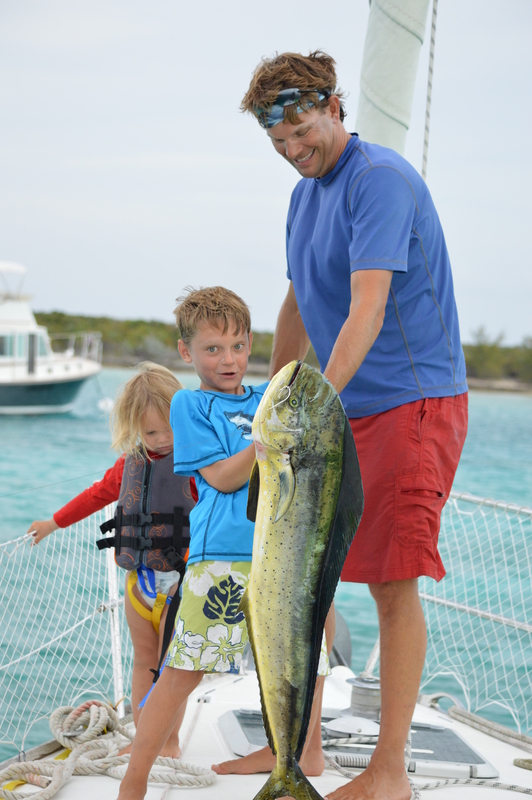 Bonus Question – What has Dad jumped in the water for to retrieve? Answer: an anchor, a hair bow, a fork, a coffee cup, a plate, a plastic bag, a snorkel, hats, the dinghy, portable VHF (it did not survive), a Bahamian $5 bill (it sunk), and clothes that were drying. We plan to continue to interview the kids every few months. If you think of any questions we should ask next time, let us know. Love the honesty of this post. Great questions and responses. Jen, I only wish I could send you a giant bin of fresh produce from co-op! Living without things you are used to will only make you appreciate them so much more. 🙂 Thinking of you guys always. Where do you think you’ll dock in Florida ? Back to Biscayne Bay ? 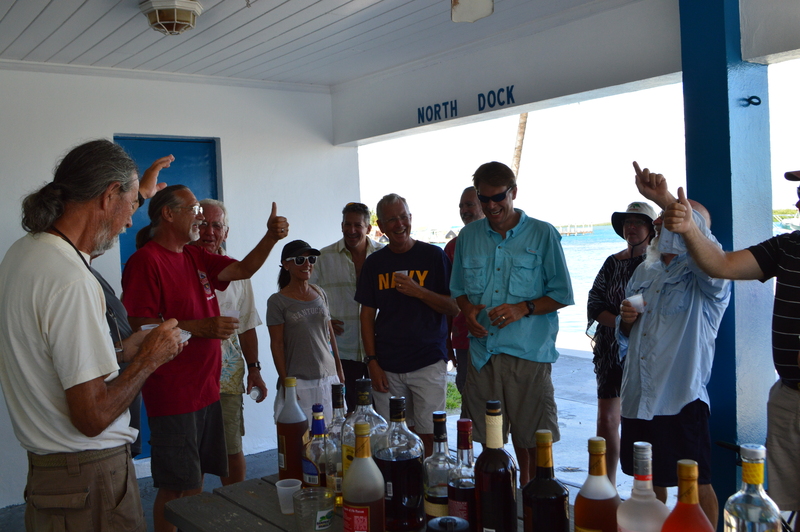 Looks like you guys are having the time of your lives… YEE HAWWwwww……..
Jack, we will dry dock the boat in Fort Pierce, FL. Wow.,,, I really enjoy reading your posts. 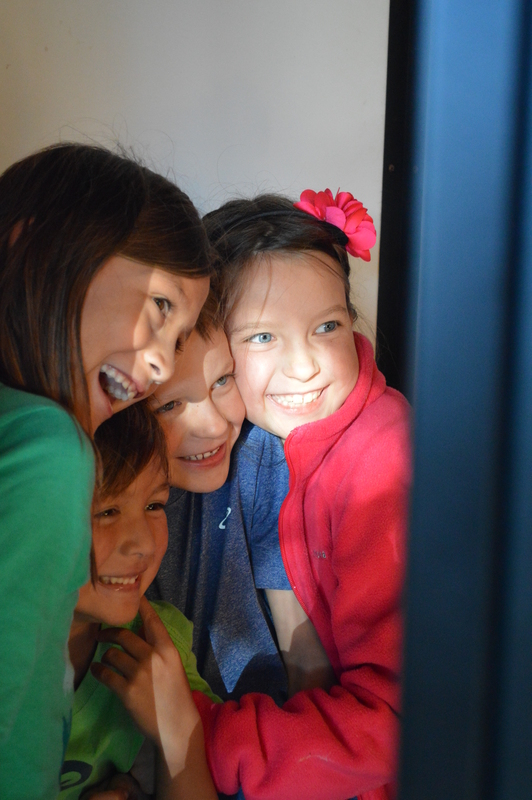 That is an amazing experience for the kids and for you as a family. Jen, My wife is in Target i think everyday. 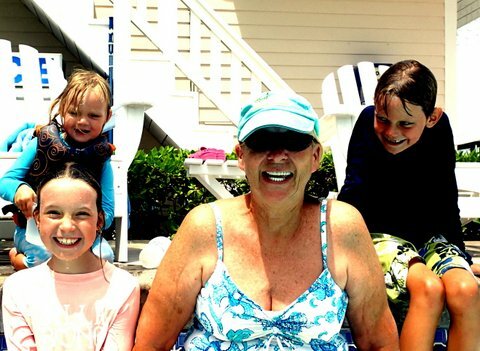 It is scary that they all know her by name…. Wow! Now that’s education in the real world…. And so meaningful! Loved reading what the kids wrote, different perspective. 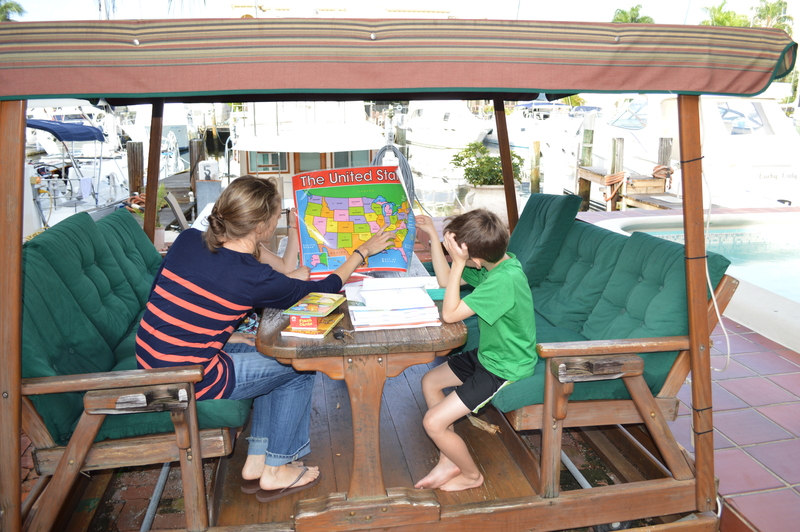 I’m all for Home Schooling, I mean Boat Schooling! Yes, I am a teacher and wish more kids could experience the real world and learn by this amazing adventure! Dawn, thanks so much. Means a lot coming from you since you and TR are our role models in life. Great post! I enjoy following your adventures. It’s a nice break from the daily grind of leads and starts (Marc will know what i’m talking about 😉 Safe travels! Mel, great question. We will use it in the next interview. And I am so glad that you and I peer pressured Marc into letting the kids get the hermit crabs! That was a fun day, wasn’t it? I loved this post!!!! I have to agree that the best pic so far is Cam with his fish! Pure joy and excitement! I will hit Target for you Jen! Big hugs from Fishers, Indiana! Thanks for hitting Target for me. When we get back to Florida in a month, I’m off the Target to buy more flowery headbands for the girls. Many have gone overboard. It’s time to stock up again. I really loved this post and how you formatted it by question and answers. It was easy to read but revealed a lot! Thanks for sharing all the experiences and hope you continue to enjoy your adventure! What a compliment coming from the blogging expert. 🙂 Thanks Kelsey. This blog is all because of you! Jen, you are more than a decent teacher! You have been teaching your children since the day they were born. Your role is simply evolving. I love following your story! Julie, I talk about you to everyone I meet when they ask me about homeschooling. The kids LOVE Story of the World. I’m going to do a post soon on our homeschool curriculum.